Medion's Akoya E7214 is a 17in notebook with a low price tag but plenty of features. It's going on sale in Aldi supermarkets next week. It's perfect for anyone on a budget who wants a desktop replacement-style notebook that can be used for everyday office work, image editing and even for higher end tasks such as ripping DVDs and encoding videos. We like it. Read our review of the most up-to-date 17.3in Medion laptop, the Akoya E7216 (MD98550), which goes on sale at Aldi supermarkets on 27 January 2011. The Medion Akoya E7214 (MD98410) is a 17in notebook with a decent configuration that can tackle office and school tasks with ease. It's based on an Intel Core i3 CPU and it's a large notebook, so it's not really something you could easily carry to and from work or the office — think of it more as a desktop replacement notebook that's almost as cheap as a netbook. It goes on sale in Aldi supermarkets on 9 September. Its specifications are more than decent for a sub-$800 notebook; you get a 2.26GHz, dual-core, Hyper-Threaded Intel Core i3-350M CPU; 3GB of DDR3 SDRAM; a 500GB hard drive (like the older Akoya E7212 you can add a second hard drive, too); and integrated Intel HD graphics. It delivered good results in our Blender 3D rendering and iTunes MP3 encoding tests, recording times of 1min 05sec and 1min 10sec, respectively. These results are about 5sec slower than what Acer's Aspire 5741 and Dell's Inspiron 15R N5010 achieved in the same tests (both of those notebooks use a more powerful Core i5-430M CPU that runs at 2.26GHz). In our DVD encoding test, in which we use AutoGordianKnot to compress a ripped DVD file to a 1.5GB Xvid file, the Akoya E7214 recorded a time of 1hr 32min, which is 17min slower than the Aspire 5741, but actually 1min faster than Dell's AMD Phenom II–equipped Inspiron M501R. So you can see from these results that the Medion Akoya E7214 is actually capable of performing as well as a notebook that costs $1299. However, its 3DMark06 score of 1606 shows that its graphics performance is weak, which means you won't be able to use it for playing the latest games. Considering that the Medion Akoya E7214 is a 'cheapie', you could forgive it for not shipping with niceties such as eSATA and an ExpressCard/54 slot. However, the Akoya ships with both of these features in addition to both HDMI and DisplayPort connections, and you also get 802.11n Wi-Fi and Gigabit Ethernet. It's definitely tremendous value — you aren't spending more than $800, but you're getting features that are generally reserved for more expensive notebooks. The only mod cons the Medion lacks are FireWire and USB 3.0 ports; even this is not a big issue as you could always add USB 3.0 or FireWire ports through the ExpressCard slot. From left to right: Gigabit Ethernet, DisplayPort, HDMI, eSATA/USB, ExpressCard/54, SD card slot. Rounding out the Medion's configuration is a built-in DVD burner, an SD card slot, a 1.3-megapixel webcam and a 1600x900-resolution screen. The screen isn't glossy, which means it won't drive you nuts when you use it in a bright room or outdoors. The bezel around the screen is glossy, however, which can be a little distracting. The screen is bright enough for indoor use, but it might not be enough to allow you to view the screen adequately if you use the notebook outdoors on a bright day. Despite being a big laptop (it's 42cm wide and 29cm deep), it has a weight that's manageable (3.2kg) and you could use it on your lap for a short while without getting tired. It will depend on how big your lap is of course — if you're petite, then you might struggle. Because it's a big notebook there is plenty of space for internal heat dispersion; throughout our tests we couldn't feel any concentrated heat through the chassis. 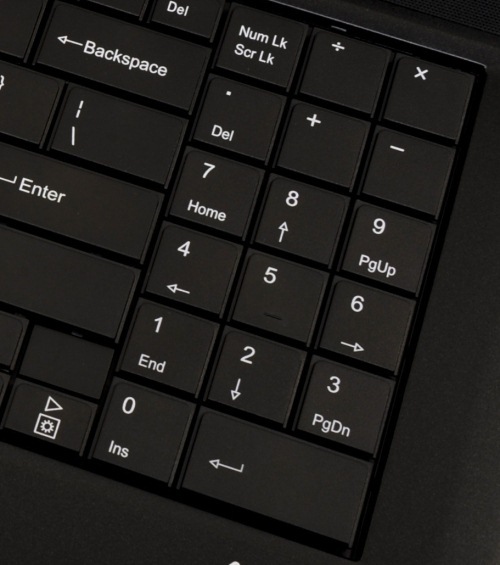 The laptop's large dimensions allow it to fit a full-sized keyboard and a number pad, and the palm rest is very spacious at around 10cm. It has a 97x54mm multitouch touchpad that supports gestures. The keyboard is quite solid and comfortable to type on, but it does make a slight rattling noise. Overall, it feels good to use and the keys aren't too stiff. The number pad is squished though, and we would have liked more space dedicated to it, so that it could have a fourth column of keys. But this is a minor quibble unless you want to purchase the Medion specifically for its number pad. The number pad is squished, so it might take some getting used to. Above the keyboard is a set of built-in speakers, but they aren't loud and so are not much good for comfortably listening to music or watching videos. You're better off hooking up some external speakers to the notebook's line out port. When it comes to sturdiness, the $799 Akoya E7214 isn't built like a tank, but it isn't a Daewoo either. Its plastic base feels quite solid and you can hold it from its edges without it bending. Its hinges are a little too loose for our liking, but they still do a good job of holding the screen in place while you use it on your lap. Overall, it's a fairly solid notebook considering its price point and since it's designed to be a desktop dweller rather than something you can take on the road every day, we think it will stand the test of time. All bets are off if you drop it though. The battery life of the 17.3in Akoya was surprising. We were expecting it to run out after about 1hr 30min, but it lasted 2hr 49min in our rundown test. In this test, we disable power management, enable Wi-Fi, maximise the screen brightness and loop an Xvid-encoded video. The long life is due to the 8-cell battery that ships with the Medion as standard. The Medion Akoya E7214 (MD98410) is a great choice for anyone who wants an inexpensive yet fully featured and well performing notebook computer. You won't be able to play games with it, nor will you be able to use it while on the road, but as a home computer for everyday office work, schoolwork, and even photo processing and light video editing, it's perfect. It ships with Windows 7 Home Premium (32-bit), Microsoft Office 2010 Starter and Bullguard Internet Security software, so it's ready to use for word processing and basic spreadsheet work as soon as you power it up.